Eating vegetables daily is good for our body .All the greens lefty vegetables or any vegetables are very healthy and good for our diet.Of course,when we eating the same kind of greens or vegetables everyday,we will get bored and lost the appetite.My mom taught me her secret skill of cooking green soft,tender and silky veggies is to use some hot water and cover the wok with lid for 30 seconds to 1 minute then dish out.The veggies is not only tender but the texture is so silky soft.I even brought the whole set of Chinese wok with the lid back from Malaysia.So in order for Mishu to eat veggies everyday,I tried to be creative.Beside that I also want to make the veggies to taste delicious and tasty. 1:Heat wok with oil at medium high heat.Add in garlic ,stir for 30 seconds then add in minced chicken.Keep stirring for 1 minute. 2:Add in celery,corn,snow pea and seasoning.Use wok's lid to cover the wok for 1 minute.Remove the lid,use spatula to stir all the ingredients well. (Do not need water) Check the seasoning. 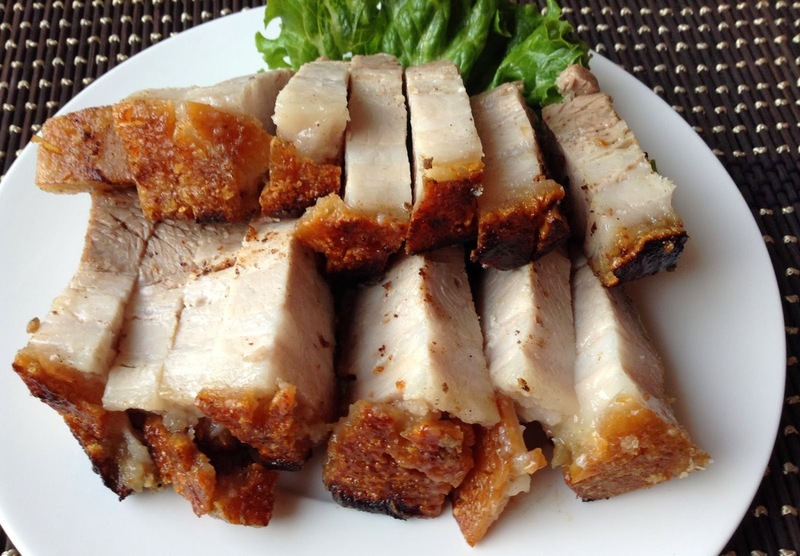 We like crispy crackling pork belly even though we know eating this type of fatty greasy meat is not good to our body. 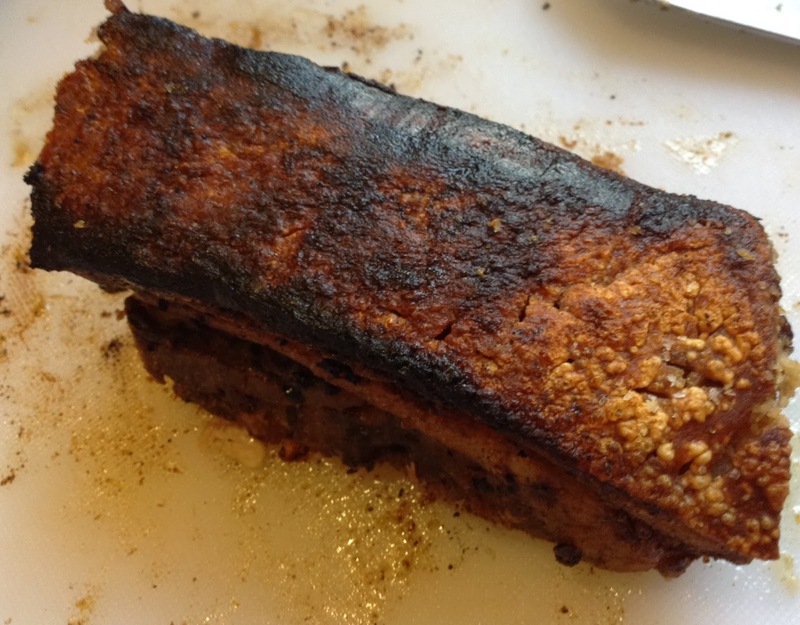 But eating this fatty and greasy meat once a while is okay better than not eating at all,I think.Puerto Rico or hispanic also love this type of crackling pork but their seasoning are different from the Chinese crackling pork belly.I adapted this recipe from Agnes Chang "Let's Eat!!" 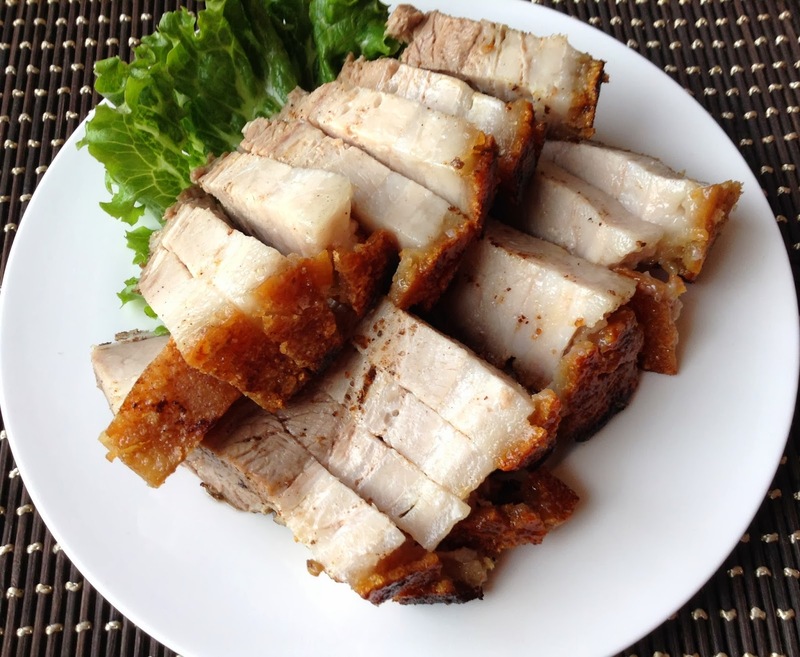 If you live far away from Chinatown or not easy to get crackling pork belly at your community,making yours own at home is not really hard at all.Enjoy!! 1:Boil water in a stock pot at high heat ,when water rolling boil place pork belly skin side down into the water.Lower the heat to simmer for 10 minutes.Turn off the heat and leave it to soak for 15 minutes to stable the shape.Dish out and drain.Wipe the meat with paper towel dry. 2:Score meat side and rub marinade all over the meat.Turn meat over,rub vinegar followed by seasalt onto the skin. 3:Use a pin holder or any sharp object or fork to poke the skin all over so it's can crack beautifully during roasting or grilling. 4:Use a piece of aluminum foil to wrap up the meat side,leaving the skin side up and uncovered.Keep it overnight in the fridge to dry up the skin. 5:Preheat oven at 350 F(adjust the temperature according to your own oven or broiler,I set my broiler at low setting)remove aluminum foil and place it on the tray.Brush skin with some oil.Place pork belly on the rack with skin side up and roast for 30 minutes.Then increase the heat to 400F and continue to roast till the skin crackles,about 20-25 minutes. (I broil each side of the meat for 20 minutes and then turn to another side for another 20 minutes)The skin should be golden brown at this stage.If there are any charred parts,scrape off using sharp knife. 6:Remove meat from broiler,leave it to cool down.Chop it up using a very sharp knife or chopper.Serve with chili sauce or soy sauce.